Since this week is homosexual pride week, one family advocate says it may not be the best time for families to vacation in the Orlando area, especially at Disney’s Magic Kingdom. According to David Caton of the Florida Family Association (FFA), the main focus is on Disney this Saturday. Nice! Even though all people with a perfunctory knowledge of how to use Google can learn for themselves that homosexuality has nothing to do with recruiting or abusing children, David Caton knows he’s dealing with a wingnut audience who will believe whatever he tells them. That means the youngsters, a captive audience, are exposed to the homosexual lifestyle. But this celebration has led many families in the past to leave the park. “They want to be in what they’ve called the playground of America so they can influence the future of America, and that’s what this is all about,” Caton explains. Actually, they want to go to Disneyworld and have a good time, just like all the rest of the people who go to Disneyworld. I’m sure it works better for the Florida Family Association’s fundraising to create a “threat” out of whole cloth, of course. 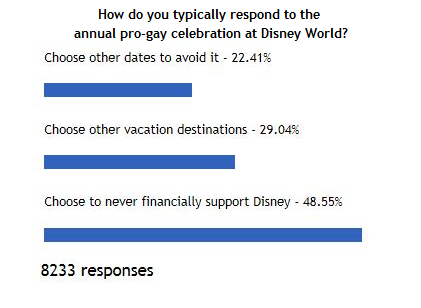 In a OneNewsNow poll in April, almost half of the 8,200 respondents said they respond to the annual pro-gay celebration at Disney World by choosing to never financially support Disney. That’s a significant poll, then. I mean, the American Family Association, the hate group who runs OneNewsNow, only puts out the most scientific polls, and surely doesn’t create polls which only confirm the fringe wingnut point of view, right? Let’s look at that poll.